Following the recent race in Oceanside, though not primarily because of it, I decided to make a change that had been on my mind since going through what was my most disappointing year as a professional in 2013. In spite of two “acceptable” results – 4th at Ironman Melbourne and 2nd at Ironman Arizona, 2013 was a lost year. It was lost to overtraining, undertraining, injury, and just “general malaise,” though not the sort that the genius possess and insane lament. Rather, it was a malaise of the kind of consistently subpar performances that drive you insane as an athlete. I was vaguely sick and/or injured for pretty much the whole year, which I mention not as an excuse for my subpar performances, but as a reckoning of just how poorly I managed myself. These things did not happen to me. I did these things to myself thanks to a variety of bad decisions and nondecisions that I made and didn’t make. Any discussion of a coaching change inevitably invites potential criticisms of the prior coach. Let me state explicitly that Michael Krueger is one of the very best coaches in the sport and that I have nothing but the utmost respect for him as both a coach and a person. He remains a friend, and I certainly intend that stays the case. In no way, shape, or form should the fact that I am changing coaches be interpreted as a reflection on Michael. We had enormous success together. As my life changed and career goals shifted, I was unable to make the sort of changes necessary in our relationship to enjoy continued success. It’s on me. Really, all that needs to be said is that in five years together (our first race together as coach/athlete was Oceanside 2009, fittingly enough), I had five Ironman wins, an ITU Long Distance World Championship title, two Leadman Epic 250 wins, and – most amazingly – a comeback from a near fatal car-vs-bike accident. That last element is especially important, because I think it is part of why it was so hard to transform our relationship in 2013. In 2009, no one expected much of me, and I surprised a lot of folks, including myself, with two Ironman wins, posting the 2nd fastest time in course history at Ironman Canada and a new course record at Ironman Arizona. But then that was all “reset” by my crash in 2010, and I was back to having no one – including me for a while – expect anything of me in 2011, which I think was a big part of why I was able to break through again, winning the Leadman Epic 250 in Vegas, Ironman Canada, and then the ITU Long Distance World Champs in Vegas. 2012 was a bit of a transitional year, where I was not originally going to go to Kona, but then thanks to some logistical breaks, I ended up racing Ironman Texas and the one-and-done Ironman US Championships in New York en route to a debut in Kona with a quick – and, in retrospect, somewhat foolish – stop at the Leadman 250 in Bend. And that’s really when things started to come apart. I was tired in Kona. I had a terrible swim – not really surprising since my swimming after racing Leadman never was as good as it was before I tacked on all that fatigue. I faded on the bike. I faded on the run. Both totally atypical of the way I normally race. 13th was a disappointment. But I set myself up for it. Racing Melbourne in 2013, where I was sick because I was an idiot in training was my fifth 8+ hour race in 10 months. I had expectations of myself – and I felt the weight, real or perceived, of others expectations on me – and lost the very things that had enabled me to be successful in the first place. I think, in general terms, I focused more on being a professional athlete than on a professional athlete. A good – but not great – performance in Arizona seemed like I had maybe grasped that and corrected it, but I think it was more an exception than the rule. A subpar performance in Oceanside to start 2014 basically confirmed (with some prodding from a wise friend) that something needed to change. It was very hard to tell Michael that I felt that I needed to change coaches. But after almost five weeks of change since doing so, I know it was right. In closing out the retrospective part of this post, I’d like to tell a quick story that captures the essence of the successes I had with Michael and also the essence of what I need to get back to. Going into the last uphill section of the ITU Long Distance World Championships course, where – thanks to the TT style start, I needed to drop defending champion world champion Sylvain Sudrie of France, Michael said to me, simply, “you do it now for a world championship.” And I did. In thinking about what I was missing and how to get it back, I immediately thought of the coach that really started me on this crazy journey, when really nobody expected absolutely anything at all of me – Joel Filliol. 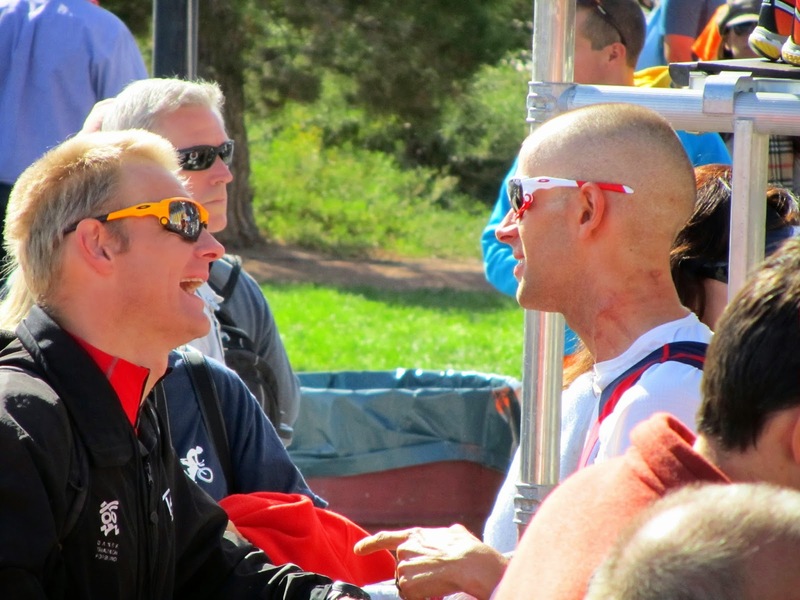 Joel and I stopped working together in early 2009 when he took what seemed like a dream job as head coach of the Great British federation, where a very formal business environment meant there would be none of the casual acceptance of a crazy American long distance triathlete that the more casual Canadian federation had tolerated (mostly thanks to Simon Whitfield). Joel left had since left that job and returned to a less formal business environment, once again run by a casual Canadian – Joel himself. Joel now coaches a globe-trotting squad of ITU and short course athletes (and now, once again, a long course athlete) that I plan to join at key points throughout the year. But mostly what I am aiming to recapture is the high performance attitude that I grew up (as a triathlete) in under Joel (and also Simon). The last blog post I wrote, about the race in St. George, was really a self-deprecating take on the relative absence of this attitude in my own racing, especially in the swim, though really applicable to the larger race against a world class field. I said before the race that I felt like – and said before that race – I had half of a fast Ironman in me, and that is – not surprisingly – what I executed. To some extent, that was the reality of training and physiology. I was not in a great place five weeks ago, and I am clearly in a much better place now. But looking at the swim, in spite of a full year of hard work, I exited the water in essentially the exact same place – relatively – as I did last year. The irony, of course, is that I actually did “feel” much better. I was much more comfortable. I was, in fact, too comfortable. I had the race that I believed I could have, which wasn’t that much worse than the race I think I could have had. But worse is worse. And better is better. Always. Change takes time, but that’s just as easily an excuse as it is a truth. I could have been better on the day in St. George. And therefore I should have been better. It’s easy – and true – to say that, in practical terms, there’s no real difference between 9th and 19th (or 17th) because the pay goes 8 deep. And, given the conditions and the depth of field, I just don’t honestly believe I had prepared myself to perform that well. No amount of self belief was going to put me in the front of that race. But some self belief could have put me further up the results. I am better than 17th place. Except I wasn’t. And that’s the ironic and self-mocking point I was making – mostly for myself – in that blog post. The great thing about sport – especially elite sport – is that it is incredibly objective. There is huge value in results and the very traditional meaning of space and time and things like, “how fast did you go?” and “where did you finish?” It really doesn’t matter how you felt. I look at the photo of Tim Don, Brent McMahon, and Jan Frodeno doubled over at the finish line and think, “I did not feel like that.” And, unsurprisingly, that was the podium, and I was 17th. I should have felt worse, because then I would have felt better. It’s very, very easy to just tweak the criteria you are using to evaluate your performance to turn it into something satisfactory. To take a me-centric approach to analysis. To let the earth move around you. But that’s not real. Or, at least, it’s not real if you are trying to be a world class athlete. The clock is real. Results are real. An attitude of self-awareness is only valuable if it also makes you self aware to your own BS. As the cliche goes, “whether you think you can or think you can’t, you’re right.” Can’t do well on fast courses? Can’t start fast in the swim? Can’t do well except at Ironman? Then you can’t. Now, as I said before, there’s no switch here that just makes up for inappropriate preparation. You actually need to prepare to do well on fast courses, and at the swim start, and at races other than Ironman. But mentality informs racing which informs training which informs racing. If you believe you can do something, you will prepare more appropriately to do it. The fact that I was not prepared to win the race does not mean that I should have raced that way. There is a big difference between “can’t” and “shouldn’t.” “Can’t” is a mentality. “Shouldn’t” is not. Shouldn’t is the decision the mature athlete makes. Can’t is the attitude of the fearful athlete. Though it’s very easy to mix up the two. I know I have. Especially lately. My friend and swim coach Lauren Hancock said to me before I left for St. George, “I had a breakthrough at the end of my career when I stopped racing to be disappointed.” I thought I knew what she meant, where I thought she meant she stopped caring about how she did. But I think I understand it now in a different way. She didn’t stop caring. She started caring more about the right things and about being honest about her expectations and her reality coming together in her performances. And I think that’s truly what I’ve been missing. I’ve been afraid, both of my own expectations and those of others. I let go of many of the right things – like a commitment to excellence – and held on to many of the wrong things, but wrong things that were easy to spin as something else. Spinning being afraid as being conservative. Racing scared as racing smart. Paula Newby-Fraser said to me before Kona last year, “what’s – really – the worst that could happen?” And again, I thought I understood what that meant – the worst that could happen was to DNF, and that is what happened, and my world did not end. But really, to borrow the most elegant summary I know, the worst that could happen is, as Pre said, “to give anything less than your best is to sacrifice the gift.” And I think I did that. Not so much in the race. That was just the inevitable conclusion of not giving my best in preparing. As I said, racing informs training which informs racing. What I said to Joel when we first talked about working together again is that I did not want to be afraid. At the time, I didn’t really know what I really meant by that, though I think it was the truest thing I could say. The Jean-Paul Sartre quote that I put at the end of the St. George blog probably seemed, like most of that post, like a comedic non sequitur, which it pretty much was in that context. But there’s a reason I chose it. It’s easy to mistake not caring for letting go. For being disenchanted – and being ironic – as truth. David Foster Wallace wrote about this in an heavy read on irony. But the truth is that not caring is easy. That’s not at all letting go. Letting go really means caring a lot. The quote on my top tube is a quote I attribute to Joel partly because he was the first to express the idea to all of us in the original BAMF crew, but mostly because he really instilled the idea in all of us. It reads, “Hope is not a strategy.” You want a strategy? You better create one. I like how Drew Brees put it, “If you don’t have a chip on your shoulder already, you better put one up there.” And if you can’t, make a change. Find a way to do it. Find someone who will challenge you to do it. I believe I’ve made that change now. And now the hard part really comes – putting it into practice. I’m not the same person or athlete I was when this picture was taken. And my goal is not to recapture the past. That never works. My goal is to be great. 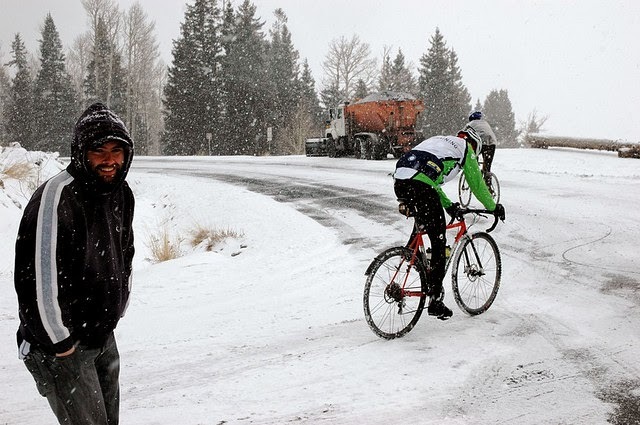 To pursue excellence, even if it means riding up to 9,000ft in a blizzard. Again. To the extent that I can be better by learning from both my past successes and my past failures, I intend to do so. That is my strategy. All the best Jordan, many great things to come! All the best you are 1 of my favorites !! !